5 Alternatives To YouTube You’ve Got To Check Out! Videos play a huge part in our online experience. When we think of watching or uploading a video online, YouTube is the name which comes to our mind. It is one of the most commonly used platforms, but if you think that it is the only choice, then you need to widen your horizons! There are many more sites which can easily substitute YouTube and let you do things that YouTube may not do that well. For a change you can use other high-quality video platforms which are available. We picked out few of such options for you, with a brief introduction to them. Some of them even have Android and iOS compatible apps. So here goes your list. 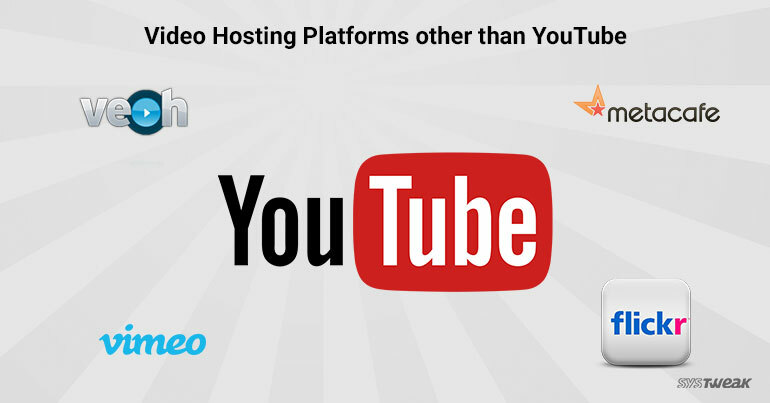 After Youtube, it is the second largest online video streaming platform. DailyMotion has over 100 million exclusive visitors per month. It quickly circulates video, making it easily visible to the other users. Its interface is somewhat similar to Youtube. You can see trending videos on the homepage and can easily search videos using the search bar on the top. To upload a video, you need to register on the site using a valid email address. The maximum size of a video allowed is 60 minutes in length and 4 GB in size. To upload video of much bigger size and length create MotionMaker account. It can be created for free. Vimeo is another major, video uploading and sharing site, with a beautiful interface. To use it you need to sign up first. It also has a video school to help you make better videos. You can watch and share videos in HD. Unlike Youtube, there are no ads. You can follow categories, channels, and collections and have access to amazing stuff each and every day. There are no charges to upload a video, but you can only upload 500 MB of videos per week. To upload more videos, you will have to take paid membership. It is majorly used for hosting images. However, Flickr also allows users to upload and share videos. To upload the video sign up for a free account, click on the Explore tab and you are all set. The upper limit to upload photos and videos is 1TB with a length of just 90 seconds in a free account. It has nothing much to offer but it allows you to privately store your pictures and videos in your Flickr camera roll. It is a good option for uploading home video collection, soon the video space is going to increase. Veoh is the best website to upload and share videos without any restriction. It has a simple UI and offers various other options like forums, messaging facility to connect with friends, groups, etc. It is much like YouTube as it lets you upload long videos. It is the perfect space for uploading full-length films and short clips. Veoh has a smart UI which makes uploading huge video files easy and quick. Among the oldest video sites, Metacafe is one which is still running with 40 million unique visits per month. It provides smooth and better browsing experience, with access to videos of various categories. Unfortunately, you can’t upload new videos as it doesn’t allow to do so, right now. It specializes in short form video content, right from highlights of the world’s best surfers, quick product reviews, and tips on how to complete a difficult level on your favorite video game. One of Metacafe’s strengths is its simplicity. Its browsing interface is fairly straightforward, with a menu bar that links to “latest,” “popular,” and “trending” videos. Must Read: 9 Amazing YouTube Hacks You Never Knew Existed! YouTube is surely the most popular video website for a number of reasons, including its huge selection of videos and association with Google. But the video sites listed above are worth checking out. You might have not heard about most of them, so just try to use them. They are just waiting to be discovered. You can pick up any of these Youtube, alternatives and enjoy a different and unique video sharing and viewing experience.